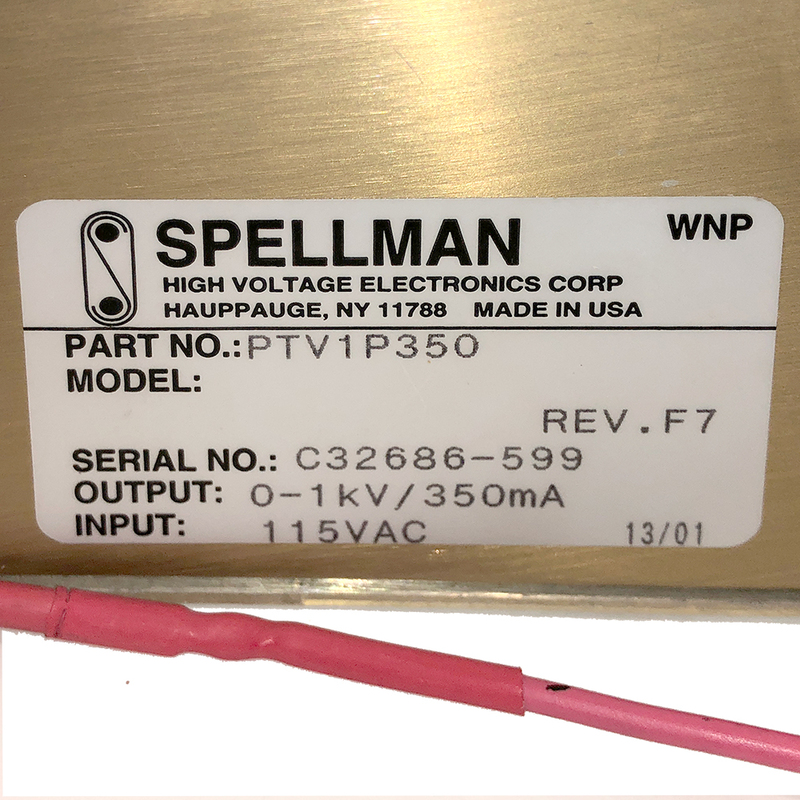 Spellman HV power supply. 0 - 1 kvdc @ 350 mA. 115v input. 10-3/4" x 3-1/4" x 11-1/2" deep. Includes manual. Matsusada power supply. Mfg. P/N: 210000198. Brand new! 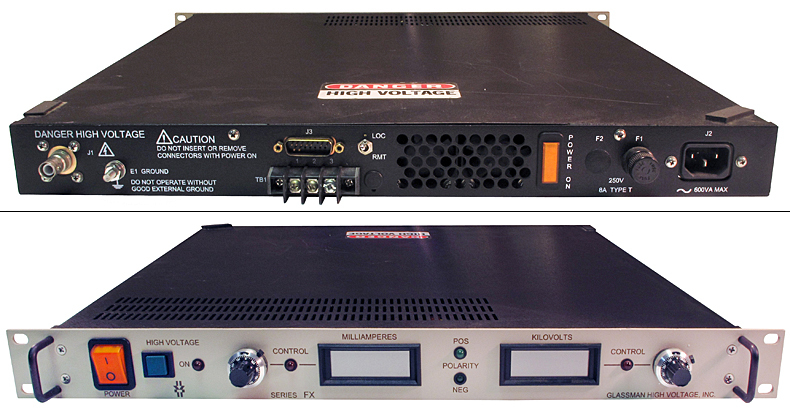 Technipower highly regulated power supply module. Sorensen / Elgar 30 kw DC power supply. Digital voltage and current displays. Over current, over voltage, over temp, surge limit, soft start, brown-out and short circuit protection. Up to 99 programmable automatic voltage and current steps; up to 99,999 seconds long each. Analog and IEEE-488, RS252 remote programming. Three operation modes: constant current, constant voltage or constant power. Hubbell 50A twist-lock connector. Like new condition. 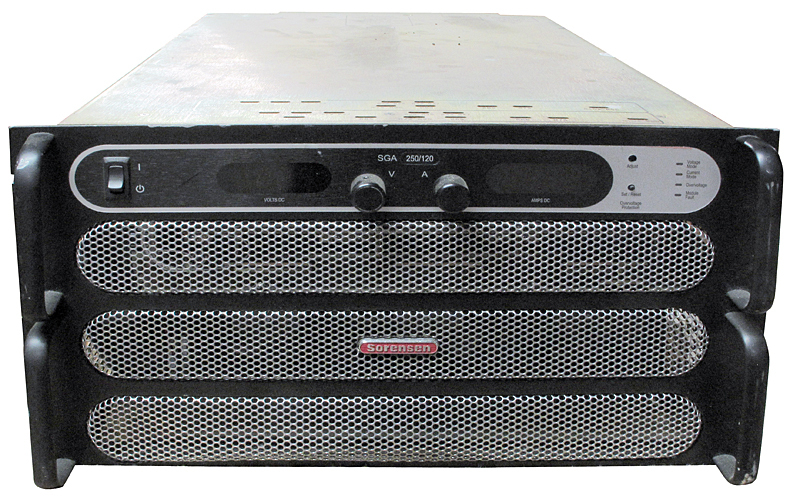 • Dimensions: 10-1/2" x 19" x 22"
Sorensen 30kw DC power supply. Digital voltage and current meters and controls. Allows external analog controls. Hubbell 50A twist-lock connector. Used, like new condition. 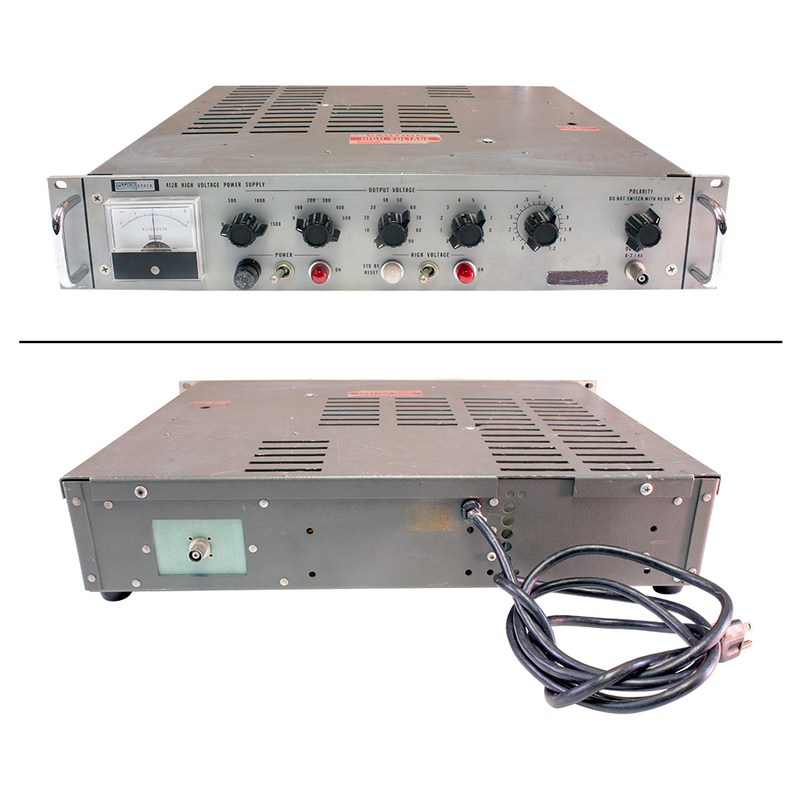 • Dimensions: 10-1/2" x 19" x 25"
B&K Dynascan 1602 high voltage power supply. A great addtion to any test bench. 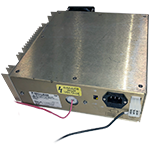 Provides filament, bias and high voltage for testing and operating small tube-type equipment. Front panel analog meters display output voltages and high voltage current. High voltage maximum current limit and be set. Overload causes the high voltage to be disconnected until the overload is removed and "Reset" is pushed. Filament voltages of 6.3 vac and 12.6 vac are also available. All outputs are on the front panel through banana jacks. 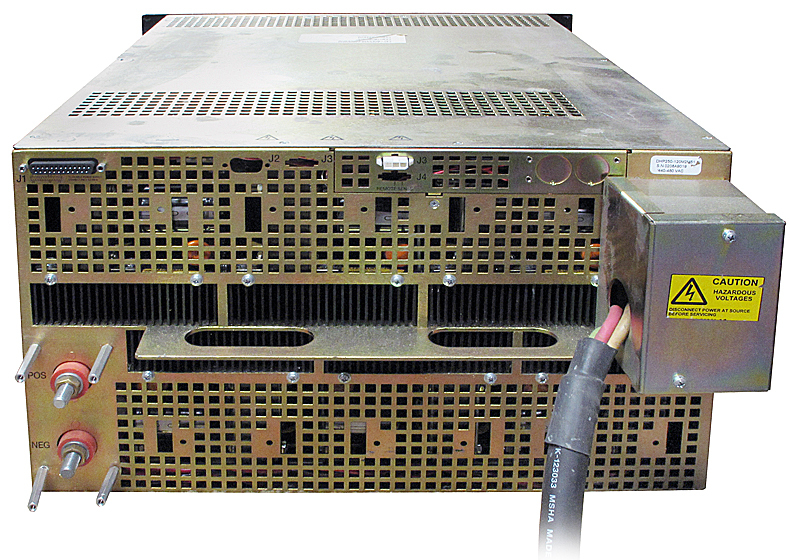 High voltage and bias plus and minus outputs are independent of chassis ground. Works to full output. 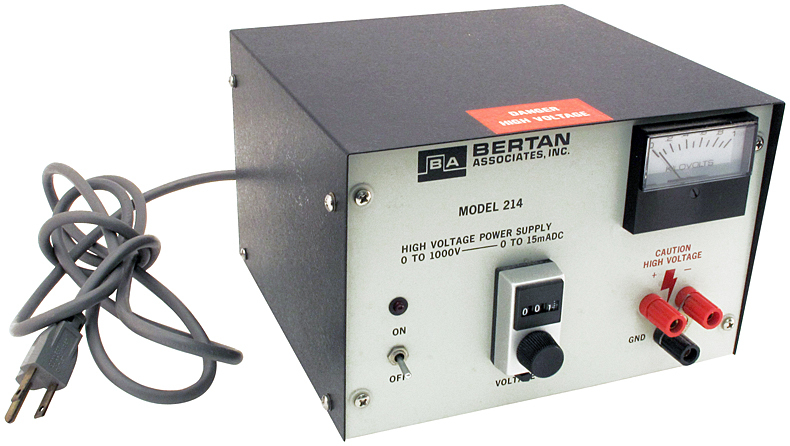 Dimensions: 14-1/4" x 4" x 10"
Bertan Associates Inc. 214 high voltage power supply. Current limits at 17 ma. Turns counter on 20 turn pot displays actual voltage within 1 to 2 volts of output. Positive or negative ground on front panel. "MHV" connector on rear panel, negative ground only. Glassman power supply. Front panel voltage and current adjust via 10-turn pot. Digital output meters. "SHV" HV connector. Can be remoted via DB-15 on back panel. Currently set to negative output. Can be switched to positive output by swapping 2 internal PC boards. Includes arc quenching and arc sense features. Like new condition. Manual included. 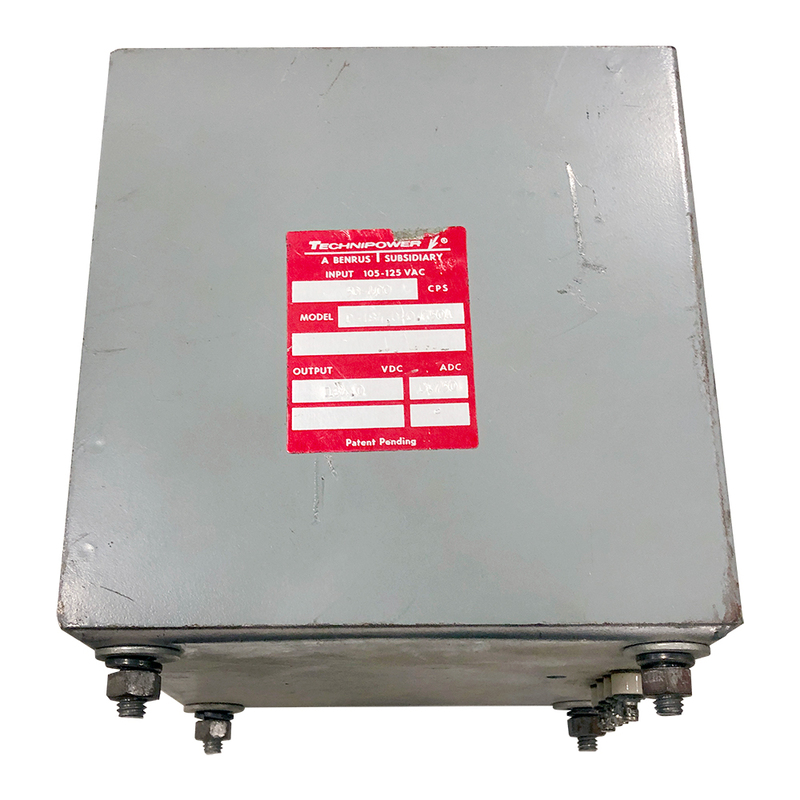 • Dimensions: 1-3/4" x 19" x 20-1/4"
Glassman high voltage power supply. Front panel voltage and current adjust via 10-turn pot. Digital output meters. "SHV" HV connector. Can be remoted via DB-15 on back panel. Currently set to negative output. Can be switched to positive output by swapping 2 internal PC boards. Includes arc quenching and arc sense features. Like new condition. Manual included. 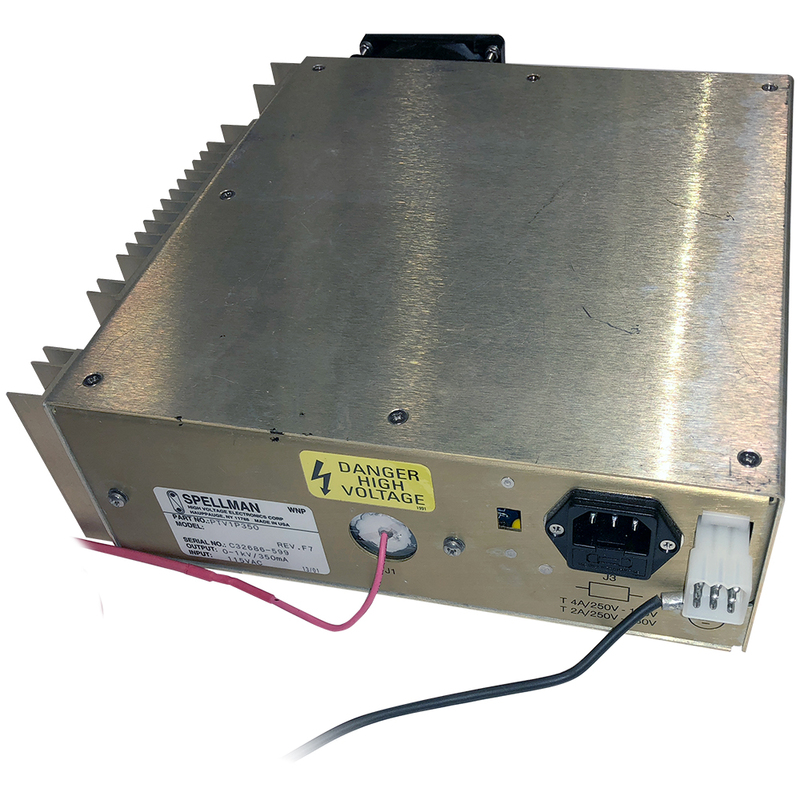 Dimensions: 1-3/4" x 19" x 20-1/4"
Glassman Europe power supply. Voltage and current adjustable on front panel. Digital meters for voltage and current. 120 / 230 vac selected by jumper plus inside. Can be remote controlled. Screw terminals for AC power. Manual included. Works to full output. 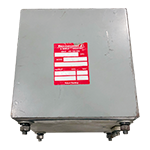 Dimensions: 1-3/4" x 19" x 19"
Electronic Measurements Inc. power supply. 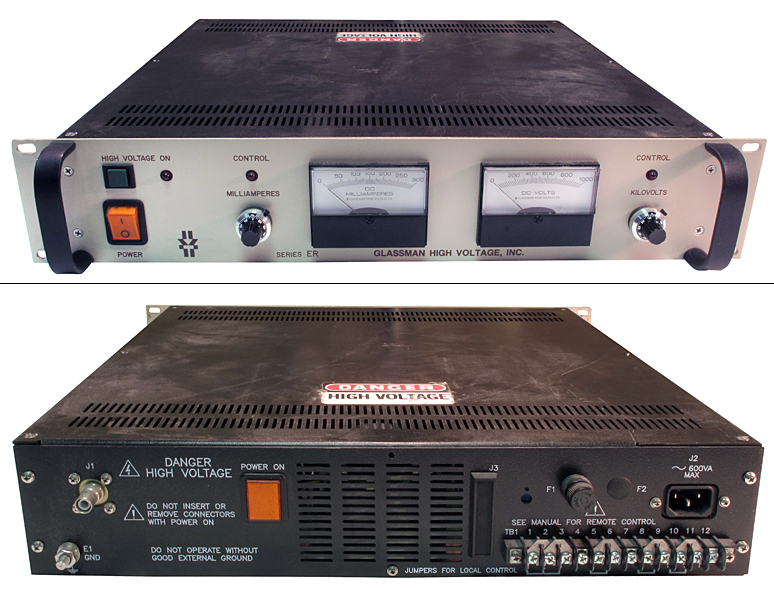 Front panel voltage and current limiting / digital voltage and current meters. Can be remoted by rear terminal strip. 10 turn voltage adjustment, 1 turn current limit. Includes manual. NOTE: Units are set for 115v AC operation. Easily changed to 230v AC via internal jumper (included). Glassman high voltage power supply. Reversible polarity. SHV output connector. Front panel voltage and current 10 turn pot controls. Digital LCD displays. 4 available! 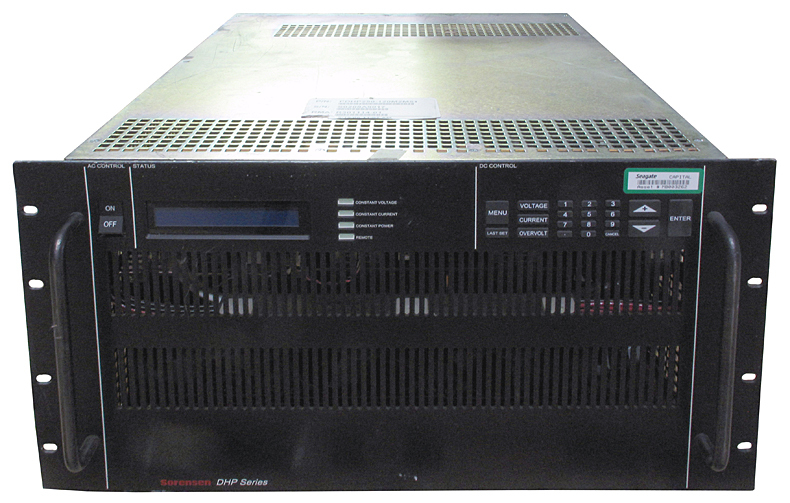 • Dimensions: 19" x 23" x 7"
Glassman high voltage power supply. Voltage & current meters. Voltage & current front adjustment. 1 phase. Includes AC cable. SHV HV cable required for operation. Order a 3 foot (CNE) SHV5425-03 or a 5 foot (CNE) SHV5425-05 cable on this page. 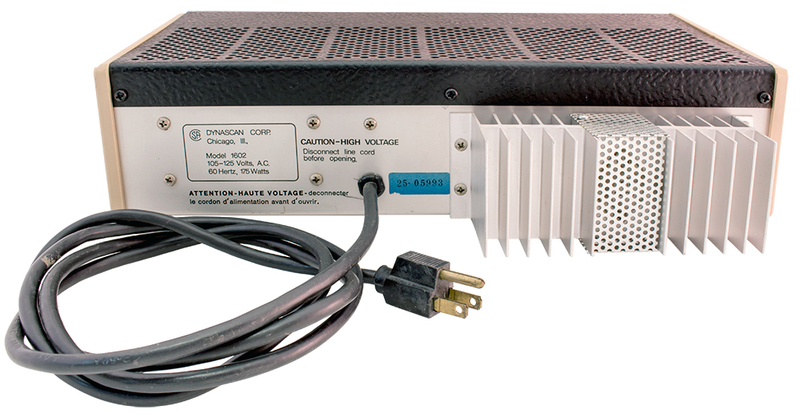 • Dimensions: 3-1/2"H x 19" x 19"
Glassman high voltage power supply. 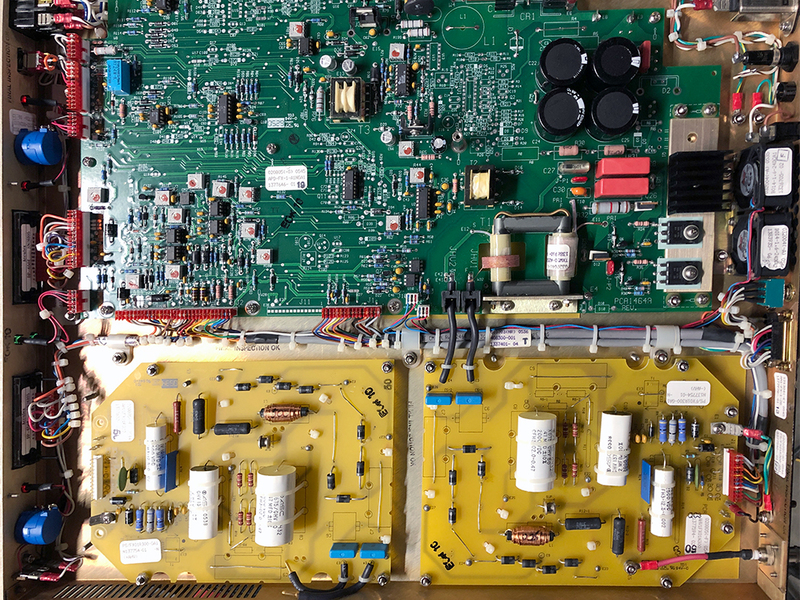 Reverse circuit board inside to change output polarity. (Now set to Negative). Output is SHV connector. Analog meters on front panel. Voltage & current adjust. Includes SHV cable. AC cord included. Used, but excellent condition. 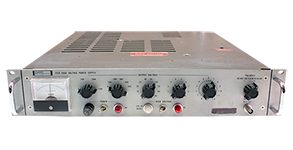 Glassman DC power supply. 1000 watts. Digital meters, voltage and current. Front panel controls. Grounded, hard wired AC receptacle on 18" pigtail. Manual included. Primary voltage selected 115v or 230v inside with jumper plug. • Dimensions: 1-3/4"H x 19" x 19"
Vacuum tube amplifier power supply. 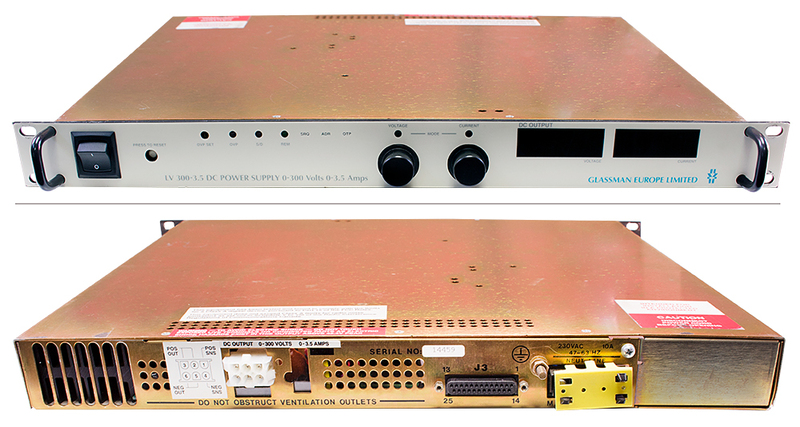 This new power supply was removed from a larger chassis on Harris broadcast assembly. It operated all B+ and filaments on a 5 tube amplifier. Includes transformer and one 20/20, 450v & one 10/15/15, 450v multi-section caps. 3" x 4-5/8" chassis. 2-1/2" high. 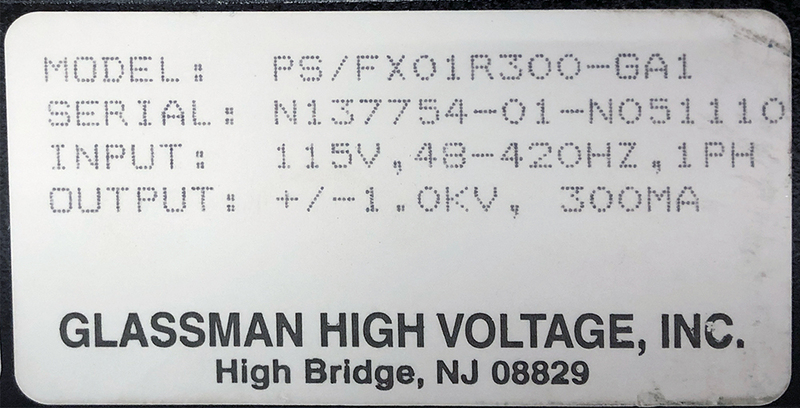 Glassman high voltage power supply. Positive or negative output. Front panel voltage & current meters. 10 turn V & I adjustment. Can be remoted. No manual. Includes HV cable. 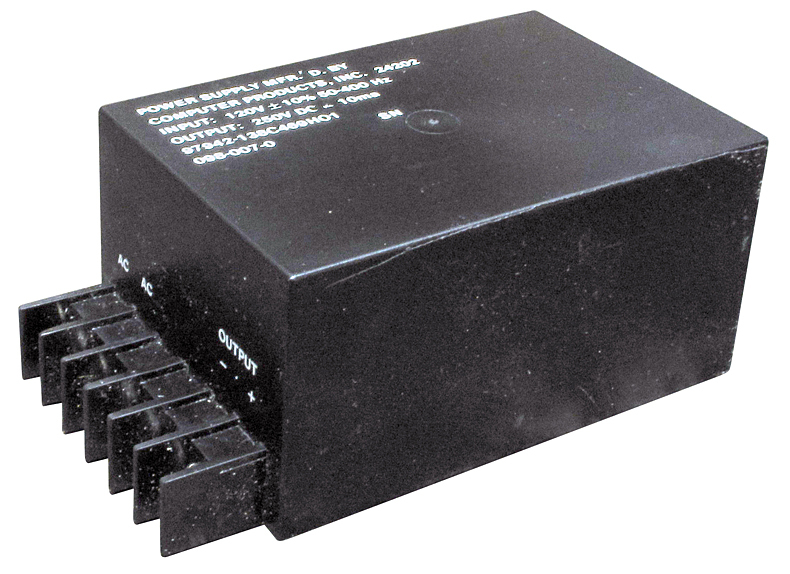 DECC AC / DC Converter. Portable aircraft power supply. Circular connectors in / out power. Built-in casters. Brand new in crates!! 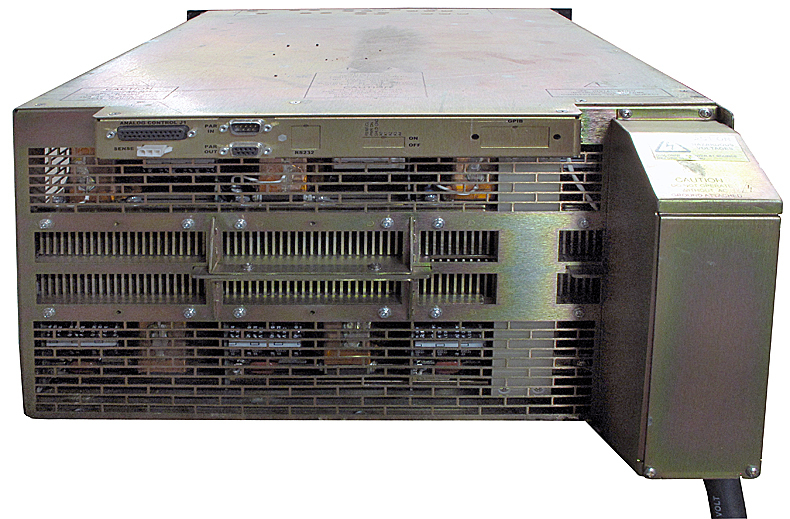 High stability regulated power supply. 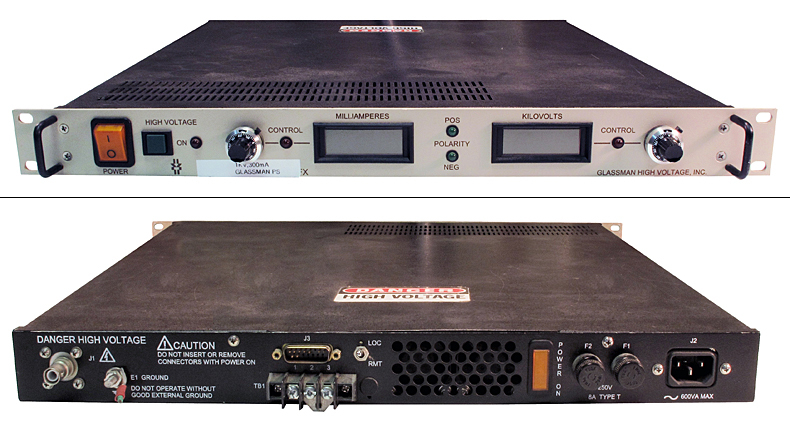 MFN - Computer Products power supply. 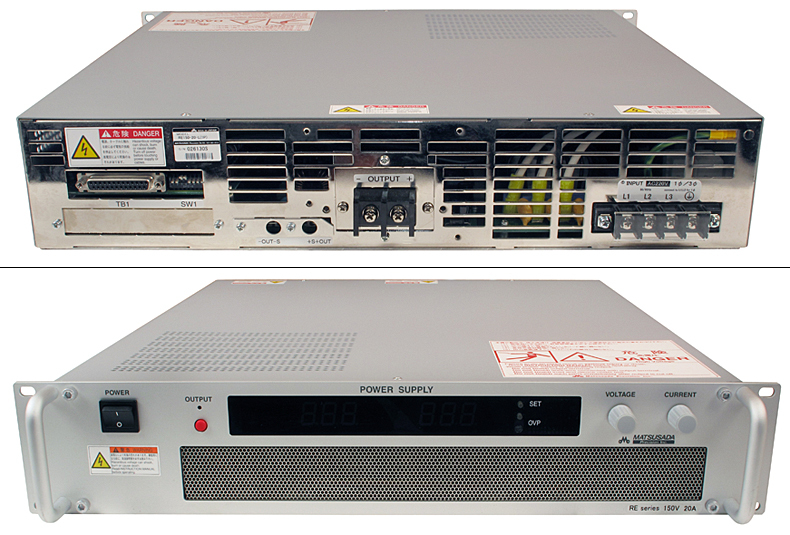 • Dimensions: 2-3/4" x 2" x 4-3/4"
Fluke dial-up power supplies are all rack mount, 10.5" high. Appears complete. Sold as is. From Los Alamos Lab. Fluke 0.5 - 2.1kv DC, 15ma, 1v steps. Fluke 0.6 - 3kv DC, 15ma, 1v steps. Fluke DC power supply. + or -. Output in 0.1v steps. "BNC" front and rear panel output connectors. Works to full output.